Any move can be stressful, but long-distance moving is that much more so. That’s why, if your move is farther than just the Lincoln Park to Evanston, you want to be sure you’re working with Chicago long-distance movers you can trust. 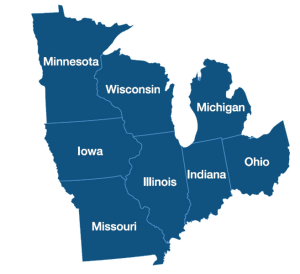 We offer cost effective long distance moving services to Wisconsin, Michigan, Ohio, Indiana, Missouri, Iowa, and Minnesota. We never consolidate moves, so you will have your own truck for your exclusive use! At New City Moving, we know Chicago — and we have moved people and offices from all over Chicagoland. Whether you’re moving from the city out to the suburbs or vice versa, and whether you’re moving four miles away or forty, we can help. We offer the same level of professionalism and care for your short-distance move as we do for your long one. Other Chicago long-distance moving companies may require a large move before they will make the effort, but we’re just as happy to move you into a one-bedroom apartment as a three-story suburban home. In fact, if you are moving to a smaller home, you may want to take advantage of one of our many storage options while you figure out what to do with your excess possessions. New City Moving truly is a full-service mover for your long-distance move. We have plenty of packing supplies to get you started and can even do some or all of the packing for you at your request. We’ll move all of your things safely and quickly, and when we finally get to the end of your move, we can unpack everything to your specifications as well. Long-distance moves can bring a lot more anxiety than short-distance moves because everything is magnified. People fear that there is more of a chance that things could get lost or broken. If something gets left out or goes missing, it may be harder to recover the item. One conversation with New City Moving will put you completely at ease. All of our personnel, from movers to support staff, are highly trained and vetted before joining our business to ensure you get the best possible customer service for your move. There’s no need to put off your long-distance move in Chicago any longer. Simply fill out and submit the electronic form for a free estimate on your long-distance move with New City moving today.